No, don’t worry, I’m not going to write about these guys every day. But a Talking Time member was kind enough to source a bunch of G.I. Joe KRE-Os for me, and I’m kind of in love with them. They’re all basically the same chunk of plastic — they share the same parts — but the paint and other details make them all feel unique and distinct. The standard Cobra Trooper, for example, is fairly basic. He comes with nothing but a very oversized take on the classic Cobra Dragunov rifle (did you know that in the early days of the toy line, Joe characters used NATO weapons while Cobra gear was drawn from the weapons commonly employed in Warsaw Pact nations? Are you even old enough to remember the Warsaw Pact?) 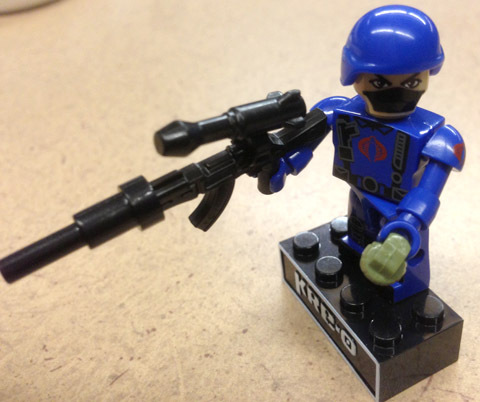 and a grenade that he has to hold because he has nowhere to stow it on his blocky plastic bod. Meanwhile, the Cobra Ninja Viper looks wildly different despite the only difference in their cast parts being a soft rubber hood where the Trooper has a helmet. 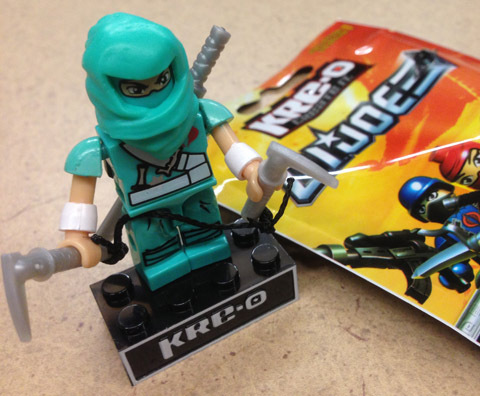 Again, I’m impressed by these toys’ fidelity to the source characters: Not only did they do up the Ninja Viper in its weird turquoise color scheme, they got all the pain apps right and gave him a backpack that hooks over his neck-peg. They even included a string (which you have to tie yourself) to bind together a tiny version of the original figure’s odd combination ice pick/nunchuks. Sadly, Ice Cream Soldier and Captain Grid-Iron were not included in this wave of figures. Maybe next time. This entry was posted in Toys and tagged g.i. joe, kre-o, toys. Bookmark the permalink. Does this extra time in your life mean that we might see a return of BakeSpite. I always enjoyed about reading about you and your wife cooking together.